If you would like to adopt a Penguin, you can either click here to print off the adoption registration form or you can ring the Adoption Co-ordinator at the Seal Sanctuary on 01326 221 361 and quote your credit card details. Please do NOT send emails, as there will be a long delay before the Seal Sanctuary replies. The cost is - "Adult £50" - "Child (3-14yrs) £30"
You will receive a photograph of your animal, adoption certificate, welcome letter, fluffy penguin, and annual entry pass that entitles you to FREE admission for one year. Each penguin has a different coloured tag to be able to tell them apart. 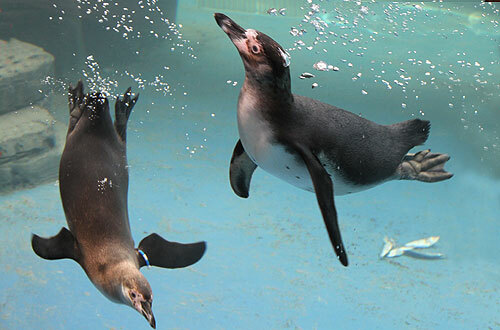 Male penguins have a coloured band on their right wing and females on their left wing.